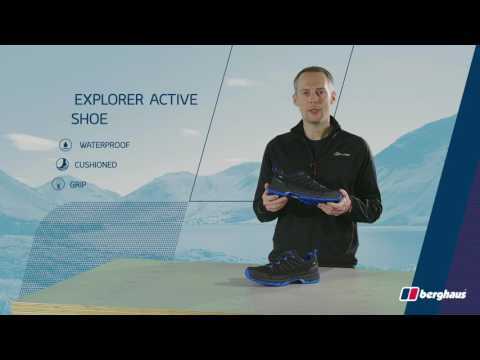 Fully waterproof, high performance hiking shoe, the Explorer Active brings all-day comfort to a host of activities. Robust and highly durable no matter what you’ve got planned for the day, these great looking shoes really stand up to the test. Boggy terrain is no match as superb traction from OPTI-STUD® outsole helps to keep you on your feet, and as they’re waterproof and breathable with a GORE-TEX® lining, your feet can enjoy all-day climate control. With comfy cushioned soles and high level stability you can hike from sunrise to sunset. GORE-TEX® WATERPROOF GUARANTEE - Keep feet dry with the incredibly waterproof and breathable GORE-TEX® lining. So say goodbye to soggy socks. ALL DAY HIKING COMFORT - Superb cushioning from OrthoLite® footbed combined with EVA midsole helps to absorb shocks for greater comfort on rough terrain.